The Most Popular Tourist Attraction in NC. See more fun videos from the Funny Bus on our YouTube page. Connect with us on Facebook, Instagram, and Twitter. IMPORTANT DIRECTIONS: We DO NOT have a brick-and-mortar building. The bus departs from the FIRST WARD PARK in front of the GOOGLE FIBER BUILDING at 301 E 7th St. Directly across the street from IMAGINON (the Children’s Museum) by the RAIL ROAD TRACKS. The 7th St Market is also across the street for restroom use and to purchase beer and wine to bring on the bus. PLEASE make sure you are ON E 7TH ST. in front of FIRST WARD PARK! No, there are no seat belts on the bus. No babies are allowed on the bus. No refunds will be issued for tickets purchased for small children. Can we book the whole bus? Yes. 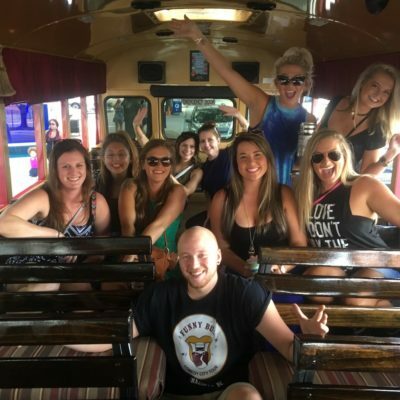 You can book the entire bus for regular tours or private tours. Please call 704.659.3186 to make those arrangements. Sorry, beer and wine only, please. Passengers will be asked to provide ID to prove they are 21 years of age or older. If you bring a cooler on-board the bus it must fit on your lap. All beverages must be closed when you board the bus and no open containers will be allowed off the bus. You may also purchase beer and wine at the 7th Street Market. How far in advance do we need to purchase tickets? Our tickets are sold on a first come first serve basis, which means there are only so many seats on the bus. It’s always best to purchase tickets in advance to make sure you have a seat. Occasionally we can honor last-minute ticket sales. Seating is on a first come first served basis. If you have a ticket you have a seat and there isn’t a bad seat on the bus. If you want to sit together we suggest you arrive early. Each tour will last about 90 minutes with a 15-minute bathroom break in the middle of the tour. Wear anything you like except your birthday suit, however, keep in mind our bus is an open-air bus similar to a trolley, so we recommend you wear weather appropriate clothing. If it’s cold or raining we will roll down the clear vinyl window coverings and turn on the heaters if needed to prevent the cold air or rain from getting in the bus as best we can. The bus does not have air conditioning. Is it appropriate to leave a gratuity? Absolutely, your tour guide and driver really appreciate your generosity. Unfortunately not. The doors are not wide enough to accommodate a wheelchair. We will do our best to accommodate all of our passengers and can store mobility devices if necessary. Please call us to discuss your specific requirements. No, The jokes heard on the bus are similar to the ones heard in a comedy club. No one under 13 is permitted, we recommend following guidelines of bringing your teenager to a comedy club. Our policy is NO REFUNDS. Why would you want to cancel such a fun time? The price is $27.00 per ticket. The tour starts in front of First Ward Park ( 301 E 7th St). There are several parking options around the park. There is a parking garage if you need covered parking ($$), several parking lots that touch the park ( $) or if you ride the Blue Line ($) there is a stop at the 7th St Market, which is right across the street. Where does the bus pick me up? In front of First Ward Park at 301 E 7th St. Please make sure you are ON E 7th St in front of the First Ward Park. Book the Funny Bus for your next Corporate and Business get together. Lots of fun and great for team-building. PC friendly tours and many options to choose from. What better way to bring a team together than through laughter? Call to schedule the fun! Do you want the BEST Birthday Party EVER? Your guests will LOVE the Funny Bus. Book the whole bus or get a discount on groups larger than 20. Call to schedule the fun! A Bus Load of Friends. Perfect for Any Occasion. Fun for Any Crowd. Our team can “Roast” certain guests or make anyone’s day extra special! Call us with your wildest requests! We had a great afternoon on the Funny Bus! Being new to Charlotte, this was a fantastic way to learn about our new home. Our guide/comedian was Roxanne; she was a blast, informative, and hilarious! We will definitely return with out of town guests. I highly recommend this tour! Thanks for the laughs Roxanne! Fantastic! JJ was hilarious, the tour was informative (I learned things I didn’t know and I’ve lived in Charlotte for more than a decade) and you can drink during the tour. We had a great time. CHURCH! Our tour guide JD and driver Dee were awesome! Dee got us around safely and was super sweet. JD was hilarious. Upbeat and very informative about the city. The tour surpassed my expectations and I will definitely be returning to Again. Thanks you making my first visit to Charlotte memorable! BYOB bar on wheels? Are You Kidding? Sign Me Up, Please. I laughed so hard I was rolling in my seat. Seriously, My cheeks hurt, and had to gently massage them at the end of the tour. I could tell that Brandon, our tour guide/comedian, really enjoy & love what he do — and he’s good at it too! We did the Rates R Funny Bus Tour and it was definitely worth it. Ill gladly do it again with anyone new who comes to town. I was able to learn a little more about Charlotte in a humorous way. I also loved that I was able to see places Ive never been to before so I can write them down and try them out. Awesome tour! Absolutely hilarious! “White John” had great jokes and kept the whole bus involved! We had a great time and can’t wait to do it again! My husband and I visited Charlotte for the first time last weekend and took the funny bus tour with some friends. We had an awesome time! What a great way to get the feel of a new city… some history, seeing the neighborhoods, and the sports arenas and lots of laughs!! Both our tour guide and driver were great. The length of the tour seemed perfect.. and we also loved the pit stop at the brewery to refresh and stretch your legs for a minute. The Bus was clean and comfortable. Great way to spend a couple hours and get to know the surroundings! Had a great time learning about Charlotte. Roxanne kept us entertained and interested. It’s a great way to spend a portion of an afternoon at a reasonable price. Went on the Funny bus last night. our Comediean was Thomas and let me tell you he was amazing!!! If you go on and he’s working you will have a blast. He was very interactive and we never had a dull moment. Also our bus driver Konica was a great time and very funny as well. Definitely planning on coming back and recommending this to everyone I know! I went with a friend who was visiting CLT for the first time as well as two other friends that had been here their entire lives. This tour was a blast for everybody involved. I was impressed by all the places we were able to see and learned a bunch of fun facts about the Queen City. JJ did a great job of keeping everybody engaged as well as laughing from start to finish. Safe to say that I will be doing this again. Very fun! Great way to spend some time relaxing and seeing the city! Our driver had the whole bus laughing the whole time! Friday 2:00, 4:00, 6:30 and 8:30. Saturday tours run every hour starting at 1:00 through 9:00. Private Tours: any day of the week. Please check the calendar for any added tours throughout the week. Tours often sell out make sure to book in advance.